Thank you for this... this post, the show, and the blog project to come. What a wonderful way to help remove the stigma. I struggle with depression, and I find strength in places where I can talk about my story and hear the stories of others. I'll be away at the time of your show, but would love to donate the price of a ticket. I'll DM you! Love it - so excited for what's to come on the blog and especially for the show! Sweet, sweet girl. Your message made me cry. Thank you for sharing your story. Ashley, you are such a gift to this world. Thank you for sharing your energy, your insights and your passions with us all. I look forward to following along all month, crying, celebrating and resonating with the honest words of pain and love that make up our lives. Thank you. 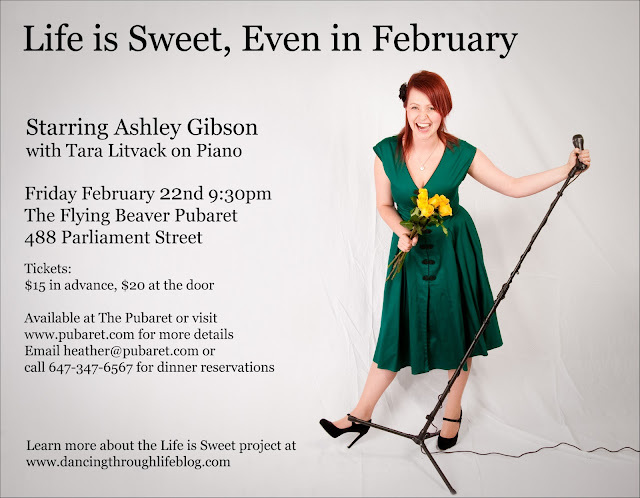 Finally, I know what #lifeissweet is! I think that bringing some light to the issues around mental illness is one of the best ways to spend a February, and I am so proud of you for tackling it in such a public way. Hugs! I write about a fairly misunderstood disorder at my blog. I'd love to be a part of your project, if not this year, than next, so I can help dispel the myths about compulsive hoarding disorder.